"Rain, chocolate and fun at the Indy Hot Chocolate race "
My third Hot Chocolate race was a return to the Indianapolis version, which last year race directors cut short to a 5K for everyone due to an impending ice storm. There would be no ice storm this year since the morning began with temperatures in the mid-50s. Instead of ice, however, runners were frequently pelted with rain. Still, the AllState Hot Chocolate 15K was an enjoyable event with helpful volunteers, plenty of chocolate and good swag. It matched my other good Hot Chocolate experiences: last year in Indy and in St. Louis in 2017. Disclaimer: I received a free entry to the Hot Chocolate Indianapolis race as part of being a BibRave Pro. Learn more about becoming a BibRave Pro ambassador, and check out BibRave.com to review find and write race reviews. The Hot Chocolate race was my first of the year, serving as a bridge to my first Boston Marathon in April and then the Ultra Race of Champions (UROC), my first 100K the following month. While I had earlier written about making the 15K a fun race, I changed my plans for the day after consulting with my coach. Since my training has focused on building my strength and endurance toward UROC, the training plan called for around 20 miles on the day of the race, March 30. In consulting with my coach, we decided to do a 10-mile warmup and then push the pace during the 15K. My coach outlined several options, including doing a mile hard, then a mile easy and repeating through the end. I arrived at the race start/finish area, which happened to be right outside my office building, with time to run an easy 10-miler beforehand. The rain was gentle as I made my way through the quiet street of Indiana’s capital city. I finished my warmup about 20 minutes before the start of the race, enough time to use the restroom, change my wet hat and gloves, and get ready for the 15K. 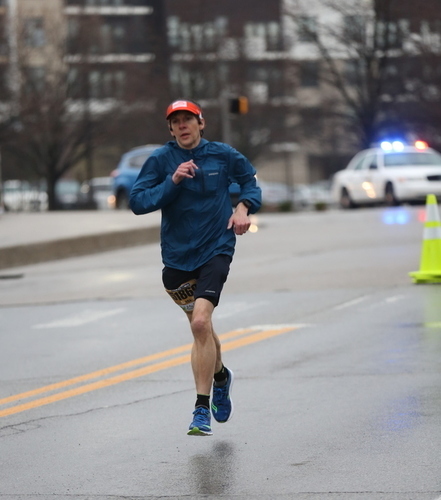 The race began while the Indianapolis streets were still dark. But there were security officials at every intersection, blocking traffic for the runners. The rain was light but the winds were steady. I started out with the 8:00 pace group, aiming for a 1:12:00 finish. The pacer was wearing a Boston Marathon hat so I engaged him about the race since I will be running it in a matter of a couple of weeks. After about three-quarters of a mile, I decided to push the pace and see how long I could hold it. As we wove our way through the city streets, I felt strong and began to pass other runners. I kept up the effort level as I continued. Around Mile 5, I felt another runner come up beside me. Well, actually behind me. He drafted off of me throughout the next several miles. As someone who is 5-foot-7, I’ve drafted off taller runners at much larger races so in theory I didn’t mind him tailing me (though it did get annoying after a while). There were aid stations roughly every 2-3 miles. When we hit the aid station at Mile 7, the course reconnected with itself, creating confusion among the runners. There were runners heading in three different directions with cones attempting to guide them the proper way. Several runners headed the wrong way, myself included, until a volunteer pointed us in the right direction. Since the cones were unclear, it would be advisable for the race directors to use arrow signs in spots where runners are merging. Other than that, the race went off without any flaws. The course itself did not offer interesting perspectives of the city. We did go through part of Monument Circle, a well-known part of the city, but the course did not go past other interesting vantage points. Since we passed the Mile 8 marker on the way out, I knew that when we went by it on the way back, it would be atop a slight upgrade. Once I got to the top, I was going to hit the gas all the way to the end. Indeed, I hit my fastest time on the last full mile, 6:59. On the way to the finish, signs counted down the last 100 meters. 500 meters, 400 meters, 300 meters, etc. Given the weather, there were a decent amount of spectators, cheering on the runners as they completed their races. I crossed the finish line in 1:09:26, good enough for 15th overall out of nearly 700 in the 15K, and second in my age group of 16. The Hot Chocolate races are a great value. In addition to the post-race treats, runners receive a sweatshirt along with the actual race and all its trappings. Since I have completed the past two Hot Chocolate races in Indianapolis, I would be eligible to join its legacy program next year if I do the race. Due to my growing list of sponsors and ambassadorships, I have decided to terminate my association with BibRave. I've enjoyed being a BibRave Pro for the past couple of years and will continue to be part of the growing community. But, at least for now, this will be my final post promoting one of their sponsored races, products or services. The Indianapolis Hot Chocolate 15K is a fun race, with plenty of goodies and a great location, adjacent to my workplace.Even without a free pass to next year’s Hot Chocolate race in Indy, it will be among the list of races that I will consider for next spring. After all, after two consecutive years of gnarly weather, the 2020 race will have to be held on a pleasant day. Right? "A busy weekend at the Chicago Marathon "
I completed the Chicago Marathon in 3:34:59, about 10 minutes off my goal but my third fastest of my 19 marathons to date. I need to get back to my previous speed to get another Boston qualifier but finishing in the 15 percent (6,863 of 44,476) was a solid step forward. It was a busy time in the Windy City with various race weekend commitments. The Chicago Marathon is quite the undertaking. Kudos to the first-responders who kept us safe. The race staff who ensured the event ran smoothly. And the volunteers who did our bidding from the expo to the early morning of race day and throughout the marathon and post-race festivities. The crowd support was phenomenal. There were very few places where rows of onlookers were not cheering on the runners. That was incredibly helpful as a couple of bouts of rain posed a challenge. My visit to Chicago started early Saturday, as I went to a special BibRave event where I got to meet several of the people responsible for the podcast, social media and ambassador program. From there I headed off to packet pickup. Given the large volume of runners, the majority of the expo was easy to navigate and get through. There were plenty of interesting vendors including big brands. At the expo, I needed to pick up a pink tag from the Chicago Area Runners Association (CARA) since I had signed up for their private before and after race area. After walking through the entire expo, I stopped to ask one vendor for help in finding CARA. He told me they were at booth 175. Wrong. A nice woman there told me they should be in the 600s — the exact opposite side of the vast building. Wrong. Over there I asked volunteers if they had a map of the vendors. They did but it was printed so small it was difficult if not impossible to read the vendors' names. Nonetheless she sent me to an area toward the front of the 400s. Wrong. Finally, I found another vendor who had an electronic map and he was able to locate CARA’s small, tucked away booth at the back of the expo. Even though they didn’t have a banner out, I don’t blame CARA. 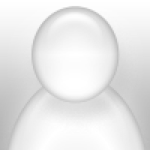 The marathon should have a readable map of vendors so that participants can find who they are looking for. Other than that the expo was fantastic. Again the volunteers were helpful, the lack of a readable expo map should be addressed. The CARA experience itself was tremendous. I received a complimentary pass but it is well worth the $60. Runners are able to use a private area to hang out, use indoor restrooms and use a gear check before the race, fairly close to the gates to access the corrals. Afterward, runners return and can easily pick up their checked bag, get a massage/stretching routine, hang out with friends and family, and also get a large bag of food, compliments of Fresh Thyme. So much winning. After I left the expo, I hurriedly checked into my hotel, then grabbed lunch on the way to a live BibRave podcast featuring marathon inspiration Meb Keflezighi and NPR's Peter Sagal. It was an interesting hour of running discussion. Afterward, I met up with a half-dozen virtual friends through another running community, the Marathon Training Academy. After talking about the race for a half hour or so, I had to bail. I had been on the go for the last eight hours since arriving in Chicago after a two-plus hour drive, and I needed to actually rest before the marathon. On race morning, it was recommended that I get to the start line at 5:30, two hours before the start of Wave 1 (I was in E Corral, the last of the Wave 1 groups). I arrived shortly after 6 and was among the first two dozen or so in the corral. Getting through security was structured but fast moving. There were plenty of port-a-potties but the lines were long. I left my corral to use the port-a-potties and returned before they closed the corrals 10 minutes before the race start. After some standard announcements and the national anthem things started to get real for the human sardines tucked in the corrals. My A goal was 3:25 and unfortunately the fastest pace group in my corral was 3:35. So I got up as close to the front as I could and pushed ahead of the pacers as soon as possible. The beginning of the race was electric. Fans lined the start area and gave us a tremendous sendoff, a harbinger for the rest of the race. The course started just outside Grant Park, then headed north before returning to the south and ending at the south end of the park off Michigan Avenue. Runners toured Chicago’s neighborhoods which meant a lot more to natives, residents and frequent visitors than it did for me. Still, the crowd support was spectacular. Aid station volunteers were great, dishing out water and Gatorade at every stop, and Gatorade Endurance products and bananas at aid stations in the second half of the race. The entire race was crowded but runnable. For the first half, I stuck to an 8-minute pace. The tall buildings were having an impact on my Garmin’s ability to track accurately. Fortunately each mile marker had a clock and I was able to determine that I started at 13 minutes after the first runners so I had a good estimate of my pace and overall time. During the second half, my pace dropped off and I couldn’t get my legs to rebound. Still I kept moving forward, thanks to my training, mantras and the crowds. It was uplifting to hear my name being called by a handful of friends who were spectating, and exchanging a high five with one of the BibRave employees at Mile 23. The toughest part of the race came at Mile 16 when a hard rain descended upon the runners. Earlier a gentle rain occurred but that felt more like a relief than a problem. I liked the fact that the marathon had a sign indicating one mile to go. The final push was among my strongest miles. I had heard several people talk beforehand about a hill at the end. I must have missed it because I don’t recall a hill. The finish line area is emblematic of the race itself — tons of emergency responders at the ready and lots of volunteers handing out a heat shield, water, a medal, bananas and a bag of snacks. Also notable: runners could get a bag of ice large enough to treat a sore body part (my left shoulder, for example). Thankfully my hotel, where the CARA center was located, was less than a half-mile from the post-race area. I was able to quickly retrieve my gear from the CARA bag check and start rehydrating, eating and chatting with my new BibRave friends. It also gave me time to reflect on my journey these last five months. Sunday wasn’t my best marathon performance. But it demonstrated that my will is strong and I am on the right track to finish out the year with solid performances. "Climb that mountain at Big Turtle 50 "
That quote, purported to be from Jack Kerouac, was on my mind as I prepared for and ran the Big Turtle 50-miler in Morehead, Ky. The April 22 race was my second at the distance and my biggest challenge to date. The out-and-back course had 8,000 feet of elevation gain and loss. The event was one of a half-dozen or so in area coordinated by Next Opportunity Events. They held packet pickup the night before the race in the same location as the start-finish area. Packet pickup was easy and a brief meeting provided helpful instructions to runners in the 50-mile, 50K and 10-mile distances. We returned the next morning where we gathered inside, waiting for the announcement to head outside about 50 feet to the start line. This convenience — inside bathrooms and a short walk to free parking — made race morning a breeze. Throughout the pre-race buildup, the race director communicated effectively with participants. He produced weekly five-minute videos, a combination of information and promotion. The website and event guide were helpful in getting me prepared for what to expect. But beyond that, I was impressed by a request I made. Due to my Celiac Disease and the need for calories during a 10- to 12-hour run, I was concerned about what aid station fare I would be able to tolerate. The race director made sure that there was gluten-free bread for a peanut butter and jelly sandwich at the midway point. All of the volunteers were helpful and friendly, especially the nice woman who made me two PB&Js — she was happy to make a third but two was all I needed. From my personal sandwich maker to the race director to everyone else involved, they were helpful, friendly and positive throughout the race. After that it’s a mix of single-track, dirt roads and a brief run on a two-way road before connecting to another section of trail. During one dirt road section, we navigated a series of rolling hills. Soon enough, steeper climbs and descents awaited us. While there were long runnable sections, there was a constant change in grade, some steeper sections than others. The dirt paths had a mix of small and medium stones, and there were a few minor stream crossings. Nothing more than ankle deep. I was hoping to hit the turnaround point at 5 hours, and made it in about 5:10. While the race started around 40 degrees, it fairly quickly got to the mid-60s. Because of the difficulty in getting from a road to the trail between miles 17 and 25, there were no aid stations between those points. The race directors made this clear ahead of time, so we were able to fill up on water before leaving 17 and then 25. Still, it was a lot warmer than I had run in recently — a theme of springtime races. With my water bottles full, one PB&J in my belly and another one to go, I headed back out for the second half. At this point, I was feeling pretty good but knew that there was still a long way to go. This was especially true for me because — due to a foot injury — my longest training run had been just over 23 miles, and I had never before ran a race with more than 6,000 feet of elevation change. This one had more than 16,000 feet of change. The second half of the race involved a lot of walking due to the hills, wobbly legs and the warmth. I ran when I could, hiked the hills and kept moving. In addition to the aid station at the halfway point, there were others at roughly Miles 5/45, 10/40, 15/35 and 17/33. The aid stations had the usual offerings — bananas, oranges, watermelon, pickles, water, Coke, chips, cookies, etc. The two closest in proximity were separated by a steep climb – down to the aid station and back up, The 50-milers would make that journey twice. While the course was generally well marked, the return section was lacking in some areas. Between Miles 35 and 40, I missed two turns. One was totally on me because I had my head down but the other one was not marked at all. Fortunately, in both cases, about the time I started looking around and questioning whether I was in the right place, fellow runners called out to me. I figured my two missteps only cost me about a half-mile (free running!). 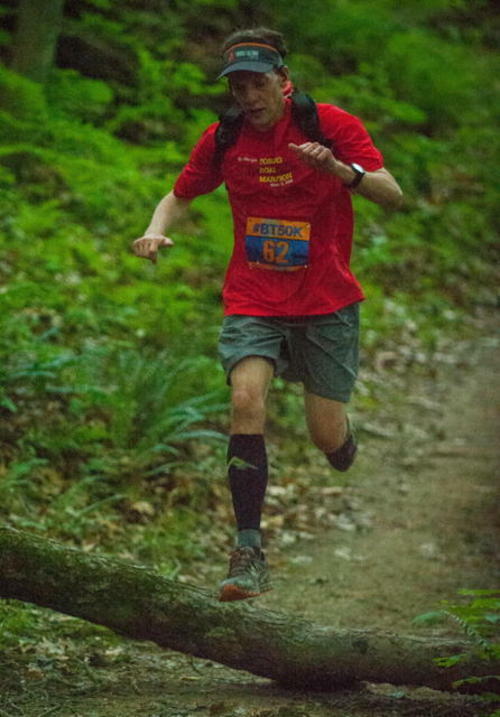 I definitely felt some elation when I started the 2-mile descent toward the finish line, pushing hard down the mountain. When I saw the campus road come into view, I knew that I was minutes away from finishing. Even with my two earlier brief off-course transgressions, I move up from the halfway point. By my count, I picked up eight spots in the second half of the race. The official results show me finishing at 11:50:55, 30th overall out of 78 and 11th of 24 in my age group. The finisher’s medal is handmade, which is another super nice touch. The race director was at the finish line to greet the runners. The food at the finish line was essentially the same as what aid stations offered. I ate what I could and waited just a few minutes for my drop bag to return from the aid station. Overall it was a great race and experience. Not sure if I will ever do another Next Opportunity race again but I did appreciate all of the little things that the team did for the runners. And that brings me to my next opportunity: the Ultra Race of Champions 100K, a point-to-point course which has slightly more elevation change than Big Turtle. Time to start thinking about climbing that goddamn mountain. "Hot Chocolate 15K: Safety first at inaugural Indianapolis event"
After a Did Not Start in my planned marathon last month due to injury, I had been looking forward to the Allstate Hot Chocolate 15K in Indianapolis. The start and finish areas were conveniently located right next to my office. My injury had been healing slowly and I felt ready for the 15K distance. It would be a good test of the injury as I prepare for ultras in April and May. The race directors did a great job communicating the changes - via email, the Facebook page and at the expo. Still, some people were upset. And kudos to the social media managers of the Hot Chocolate race series for handling the complaints with grace, thoughtful explanations and useful information. I admit my first reaction was disappointment and surprise. (I grew up in an area of the country that averages 100 inches of snow per year, so wintry conditions are nothing new to me.) But as I weighed the decision, it quickly occurred to me that it was the right call. It's not just about the runners. The race director is also responsible for the volunteers' safety too. Long after the last runner leaves the finish area, volunteers are dismantling the setup, hauling it away and driving it somewhere. Beyond that, the first-responders might be needed elsewhere during a severe winter storm. For me - and others - it was a case of making lemonade out of lemons. The race director promised that all runners who signed up for the 15K but finished the 5K would still get a 5K medal. Initially I personally did not want to be rewarded for a race distance that I did not complete. But I figured out how to get in a 15K, which was on my schedule that day. I planned to arrive at the race early, do a 10K beforehand and then finish the race. That would also allow me to drive home before the worst of the storm was expected to hit between 10 a.m. and noon. I ran my 10K at the easy pace I wanted too, finishing in just under an hour. My timing worked out well. I had about a 15-minute break between the end of my "warmup" and the start of the race. Just enough time to shed my headlamp, meet fellow BibRave pro Mark Davidhizar for a photo and well wishes, and plot out race strategy. Since the 10K went well and I didn't have any pain or discomfort in my foot, I decided to push the pace. It had been awhile since I had run hard. During my warmup run, flurries had started but had not accumulated. During the race, the storm system picked up momentum. The winds were noticeably stronger and the snowflakes were coming down more rapidly. They were not sticking to the roads yet, but the grass was hidden under a bed of fresh snow. The foot behaved throughout the race - and most importantly - afterward. I felt good throughout the race, ending up with negative splits, passing 25 people during the final mile and finishing in 24 minutes and change. But this race really wasn't about my time, it was about testing the foot and having fun. This was my second Allstate Hot Chocolate race, following the St. Louis version in December. The nationwide series of 15K and 5K races reward runners with a medal, water and a slick, easy-to-carry plastic case. The case includes hot chocolate, a banana, pretzels, a wafer bar, a Rice Krispie treat, a marshmallow and chocolate for dipping. Since I am gluten-free, I asked the volunteer if I could have a second banana instead of the pretzels and she readily agreed. I appreciated her assistance; the kindness of Hot Chocolate volunteers is one reason why I enjoy these races. The hot chocolate is a nice perk for a post-race refresher. It hit the spot. Due to the increasing snowfall, the post-race festivities were subdued. Volunteers were helpful. Runners were grateful. Nearly everyone was anxious to head home. The day before the race I headed over to the expo, which was conveniently held at the Indianapolis Convention Center downtown, soon after it opened. There were about 10 booths, including a local race series, running gear and - of course - hot chocolate and other chocolate treats. It was quick and easy to get my bib, partially because I arrived before the crowds showed up. The race started before sunlight but streetlights kept the entire course illuminated. The course began outside my office (The American Legion national headquarters), headed to downtown, then partially around Monumental Circle, toward the Indiana University-Purdue University Indianapolis campus and then back toward American Legion Mall (the other side of my office building). In fact, I could see the finish area from my office window. The course was flat, well-staffed by volunteers and security personnel, and offered one aid station somewhere around Mile 2. This was the inaugural Hot Chocolate event for Indianapolis. I look forward to the race series returning next year when perhaps the weather will cooperate and I will get to see the 15K route. "A real treat in St. Louis"
Run all the miles. Eat all the chocolate. That was the plan at the Hot Chocolate 15K in St. Louis on Dec. 10, my first foray into the nationwide series of 15K and 5K races that reward runners with a medal, water and a slick, easy-to-carry plastic case full of goodies. The case includes hot chocolate, a banana, pretzels, a wafer bar, a Rice Krispie treat, a marshmallow and chocolate for dipping. At least, I think the chocolate was for dipping. It was so cold in St. Louis that the chocolate was hardened. But with my gluten-free diet, that was fine with me as I passed on the foods containing gluten. The expo, which was conveniently held at the St. Louis Union Station hotel, was a happening place the day before the race. There were more than a dozen booths, hot chocolate being handed out and plenty of other chocolate treats (and mini candy canes, too, given the season). One of the best swag items was the quarter-zip sweatshirt (blue for guys, purple for ladies) which is really comfortable and a welcome respite from the usual race T-shirts. There was nearby parking, easy access from several hotels and volunteers aplenty. The expo itself was easy to navigate with appropriate signs and eager volunteers. Kids (I’m guessing from a local school or youth group) staffed the tables and excitedly called over people to their lines. The young man helping people understand race morning travel logistics was incredibly helpful and patient. The race had routinely encouraged runners to opt for shuttle service or take public transportation to reduce the traffic flow into Forest Park on race morning. I elected to drive since my hotel was only about 10 minutes away. There was ample parking a short walk from the start-finish area. It was cold on race morning — real-feel temperature around 20 degrees when I arrived just after 6 a.m. for the 7:30 a.m. start. There were plenty of port-a-potties for runners, as well as a gear check. I liked the fact that there were corrals to split up those who qualified for a fast time, which makes it safer for everyone involved. The course weaves through Forest Park, a sprawling park just outside the heart of St. Louis. It is mostly flat but there are occasional gentle rolling hills. There is a decent amount of crowd support. And the aid stations provide water, Nuun and — of course — chocolate goodies. The first — and last – portions of the course were in the park. In between, we ventured out into nearby city streets. Toward the end of the race, we ran through an eclectic neighborhood, full of individually owned restaurants and shops, and interesting street art. It looked like a fun place to frequent but nothing was open — it was early Sunday morning — and I had a race to run. After crossing the finish line, runners were presented with a Hot Chocolate medal. While the medals look to be the same for the various races in the series, there is a unique St. Louis medallion that is a nice touch. I would assume that each city has its open special medallion. I’ll find out for sure when I do the Indy version of the Hot Chocolate race next March. In the runners finish area, volunteers also handed out water. The finishers then hiked across a field to the tents where the chocolate goodies were handed out. I quickly grabbed mine and enjoyed the hot chocolate and banana. Overall, the Hot Chocolate race was a wonderful experience. It’s a nice niche to entice both competitive runners and those interested in a fun experience, or trying their first 5K or 15K. Certainly, there were people who walked some or all of the race. But it truly does not matter how the runners crossed the finish line. All of them should be proud to have completed their distance and wear their medal with pride. I say, "Cheers!" to all my fellow finishers, with a toast of my hot chocolate.